We are over the moon in our clan because we have welcomed a new addition, Little Miss Lillian. It has been almost seventeen years since we have had a baby around and we just about worn that one out. He drives now, when he can get the keys and frankly, he has taken a lot of the fun with him. Once they are that kind of mobile, good luck pinning them down after that, and it is a sad day, and there is nothing to do but pack up the Legos, bundle up the colored markers, corral the balls and frisbees and contemplate your decline and eventual demise. 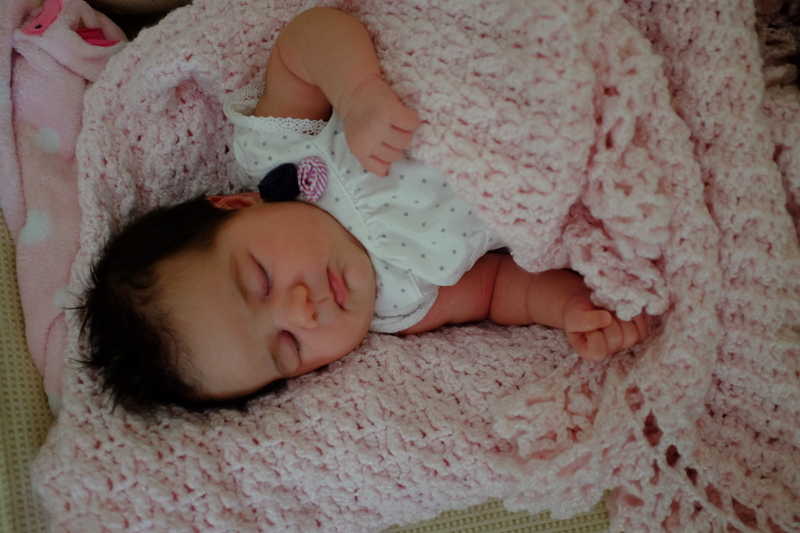 But this new baby, why she can hardly move at all except for her little newborn reflexes—rooting, grasping, startling and the like–so she is apt to stay where we put her for a long time. And that’s just fine with us. Little Lil is barely a month old and spent the Fourth of July as the main attraction on her grandparents’ sofa. She and her parents–whom we love but are a bit old hat—made the trip home for her first unveiling for the extended family. She must have gotten a bit carsick and by way of greeting she upchucked impressively as soon as they walked in the door. Her evening went downhill from there. So she was catching up on her beauty sleep on the sofa when we arrived and I wish you could have seen it, all these adults, just sitting on the edge of their chairs and standing over her, never taking their eyes off her sweet little face and all that hair. For this child was born with some hair. So much that a few days after she was born she had reached up and grabbed a fistful, and didn’t know how to let go until her father, hearing her cries, came to the rescue and pried her fingers loose. Her mother says she has good dreams, and it must be so, because as we all gazed upon her transfixed, her little nose would scrunch up, she would smile and gurgle, while she dreamed and dreamed and dreamed. It took some doing, exhausted as she was, but someone, I think her Great Aunt Judi, woke her up. It wasn’t me. We then passed her around like a nice loaf of rye and she was warm like new bread, and smelled divine. The men weren’t in the queue to hold her, because come on, let’s get our priorities straight, but even when they were talking about manly things, the didn’t look at each other but kept their eyes on her. Because babies are mesmerizing. There are all sorts of theories on this, psychological, anthropological, but why sully a perfectly good story of my sweet little great niece with all that smarty-pants stuff. Babies are mesmerizing because they are ours, they are us. We have decided, for example, that she looks like my niece, Katie, but only from the eyes up. She looks like Katie because when she was a baby, she had lots of hair, too, and dark eyes, and a wrinkly forehead, just like Lil. I can’t tell you the amount of time we have spent discussing this. As I am sure the relatives on the other side of the family are equally convinced she looks like them. After hearing the hair pulling story, which is really cute and is destined to be her first family story to follow her the rest of her life, my mother said, “well, I think she might just be something else.” Which means, a character, high-spirited, engaging, all sorts of good things. A funny little girl. But of course, we don’t know anything yet. Don’t know who she really looks like, because she will look like herself, with glimpses of all of us, here and there, but only in this feature or that, or in fleeting moods across her face. 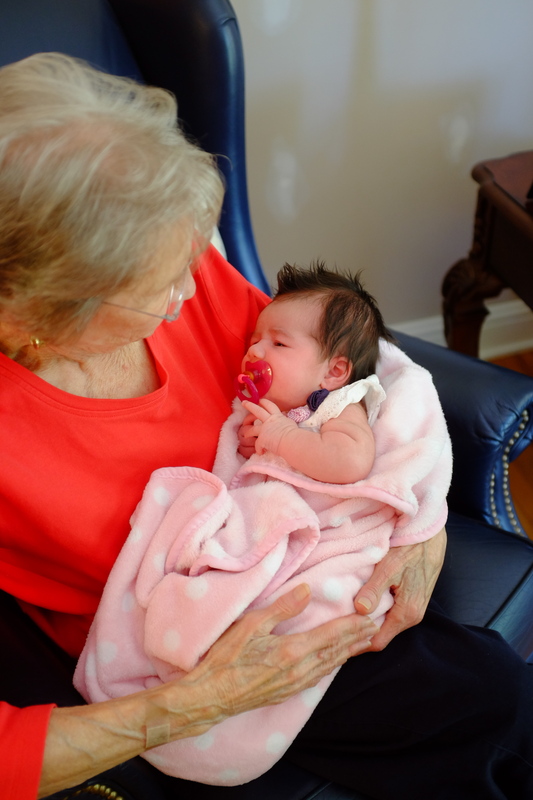 What we are doing, I suppose, is daydreaming about her as a new little person, and thinking about her in our lives and what we might do together, Christmases and birthdays, and summer afternoons blowing bubbles in the backyard. We are studying her face to learn her, this tiny thing who we will protect, defend and cherish. We are fierce, already, in our love for her. She’s ours. As simple as and sudden as that. Asleep on the couch with a headful of hair.